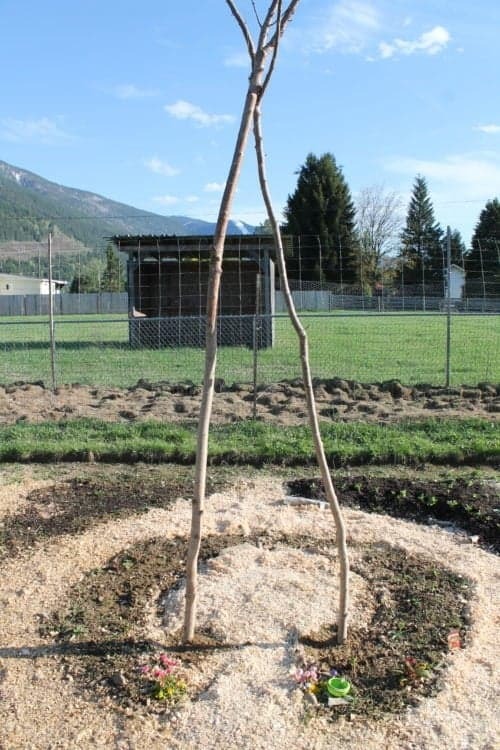 Not only is a garden trellis wonderful for vertical gardening, it’s also a beautiful garden feature. 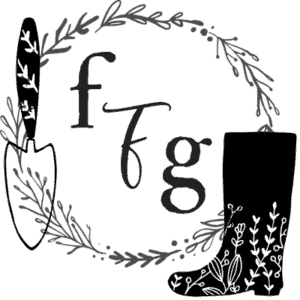 There are a lot of great climbing plants for using on garden trellis such as pole beans, cucumbers, vining flowers, small squash vines, peas and more. 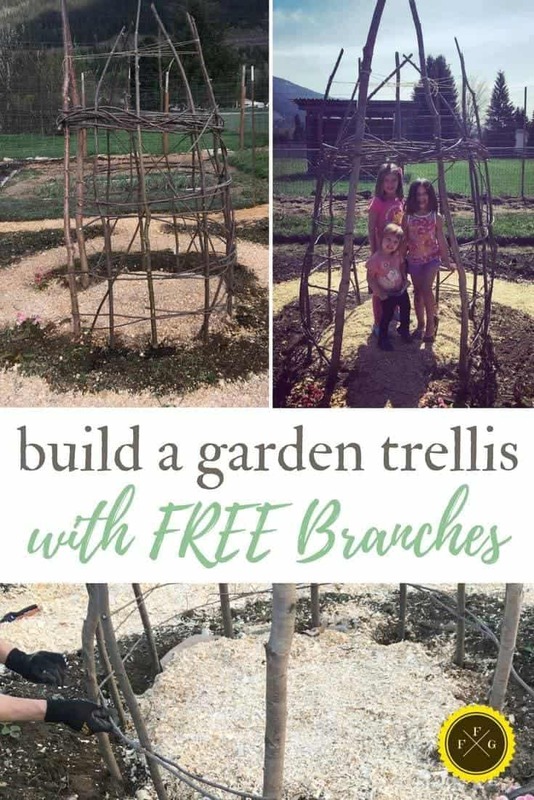 Even if you don’t have kids, this is a fun design for a wooden DIY garden trellis! If you’re an adult enjoying a fun shady spot, you can sit under it with a book. 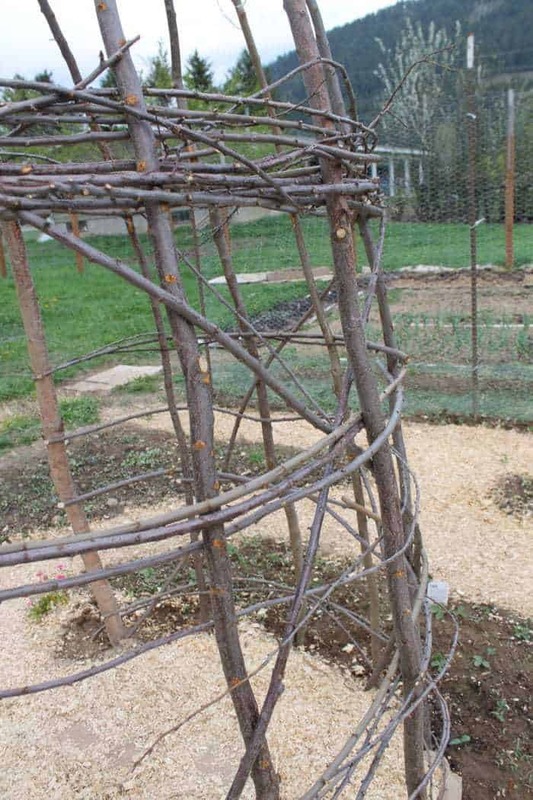 This garden trellis is made with re-purposed tree branches of different sizes making it a cheap trellis too! 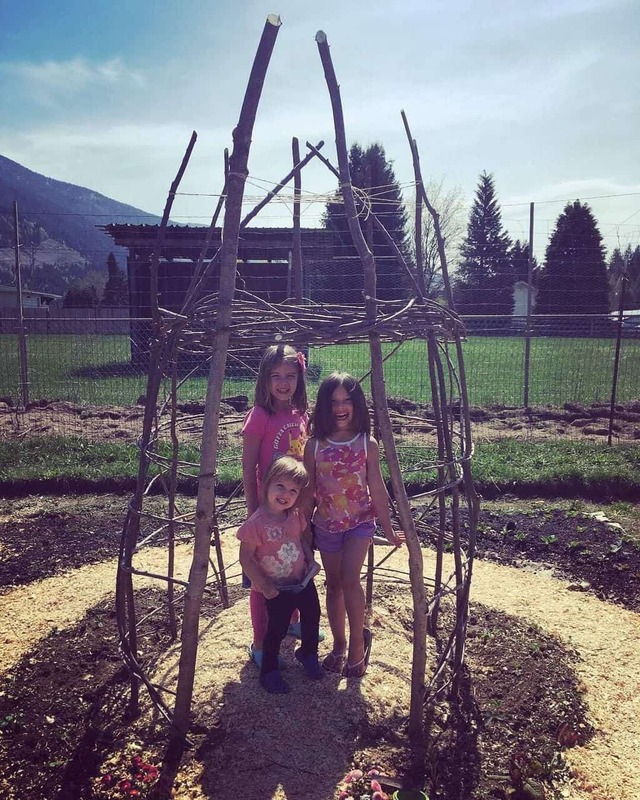 A kids wooden playhouse is a great way to use vertical gardening and create shade. 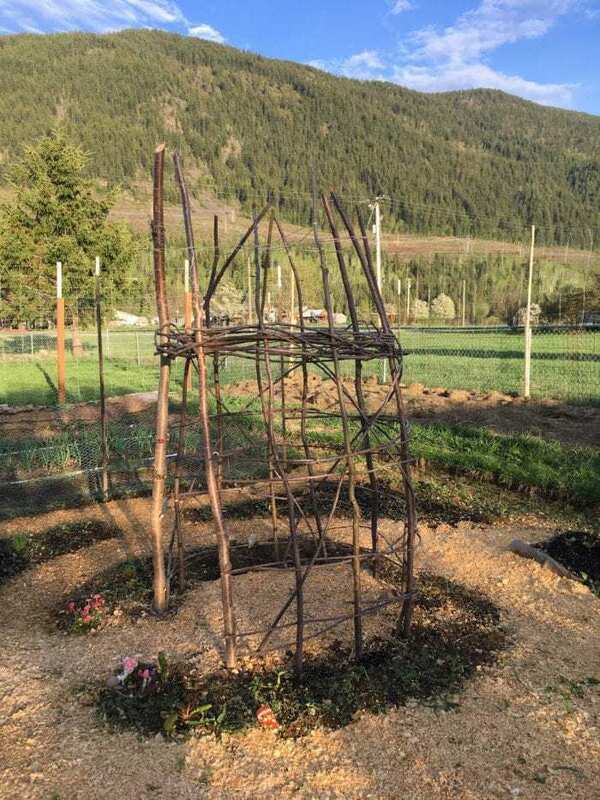 We built this garden trellis by weaving re-purposed wooden branches. 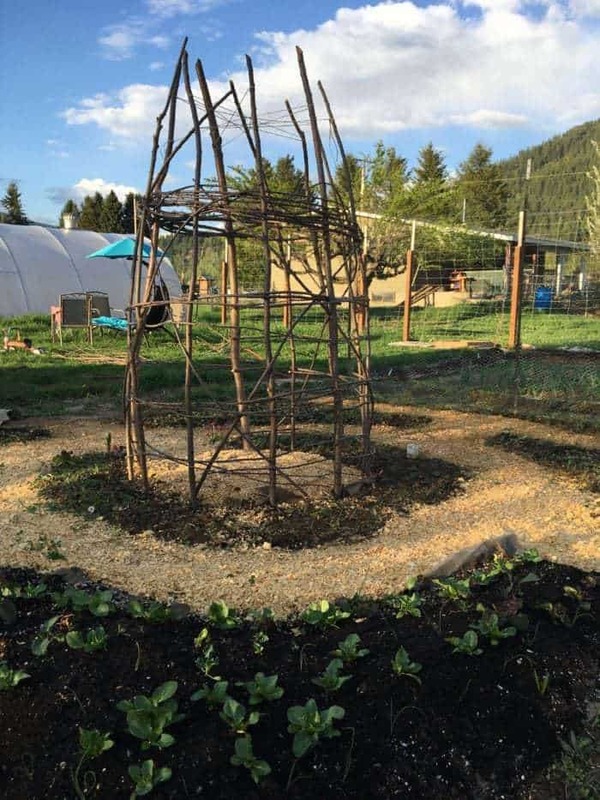 Our first idea was to create a typical garden teepee (like this one), but they’re limited on space and it’s hard to stand up in them. 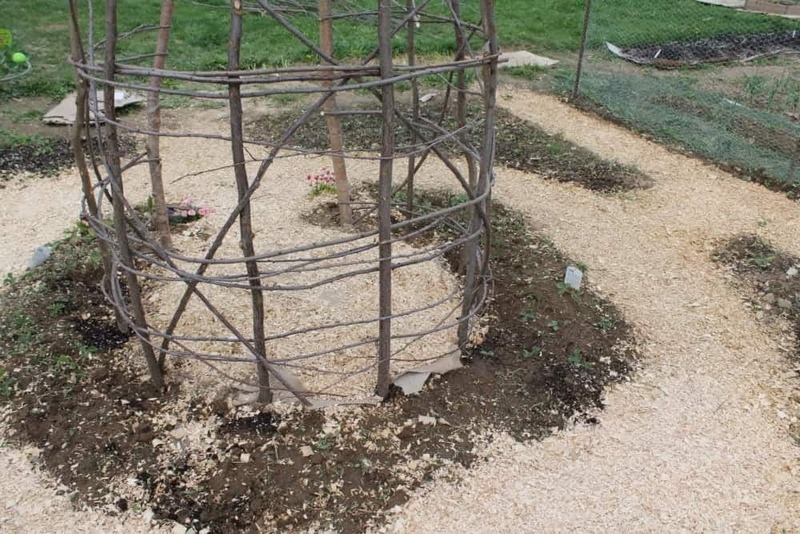 There are some trellis mistakes to avoid when designing and building a trellis structure. You want to make sure that the support posts are deep enough in the ground and that the wind can’t knock down the structure. 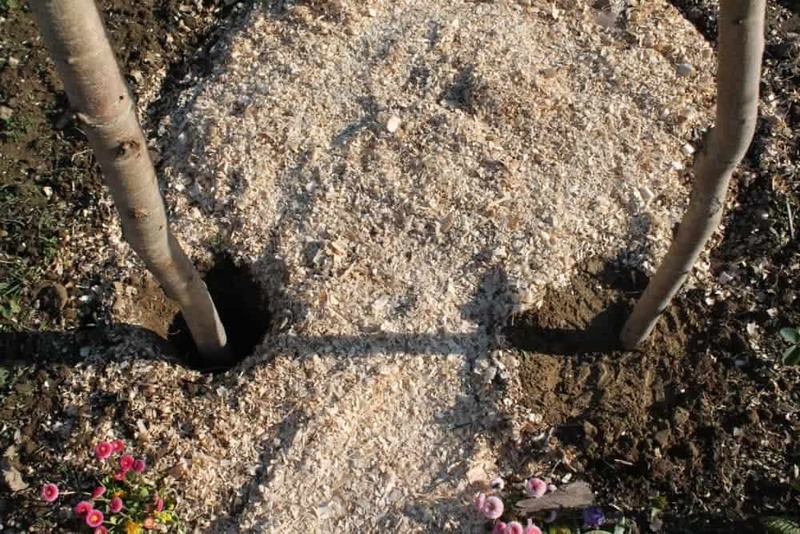 Plant the posts 6 inches-1 foot deep will offer the best support. 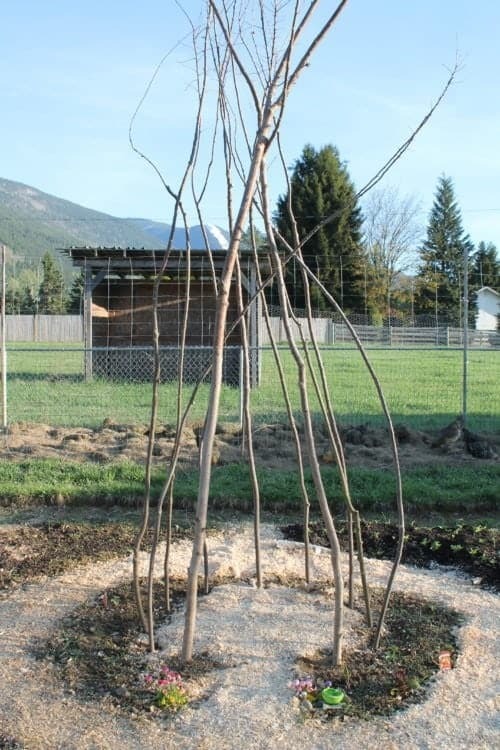 If you plan on building a wooden teepee bean trellis, you need to make sure the posts are wide enough for a strong stance. 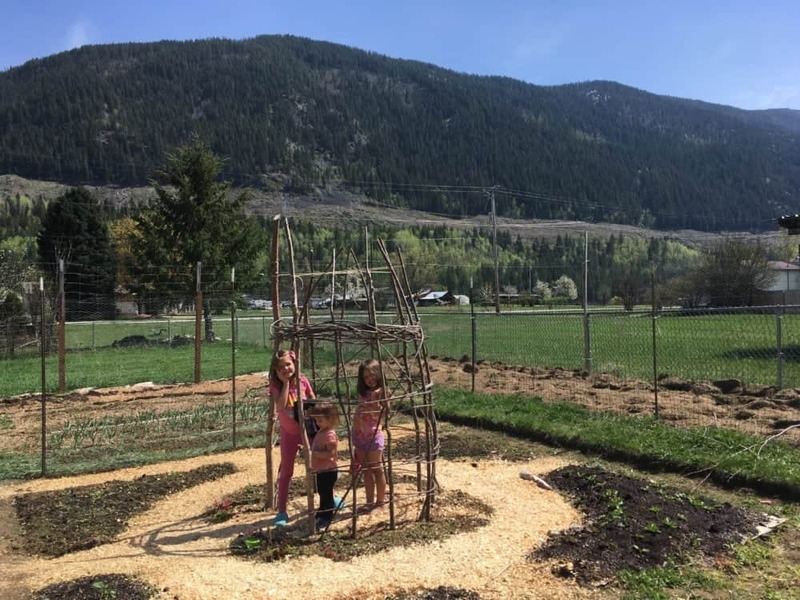 This project took 2 days to build and the materials used were free! 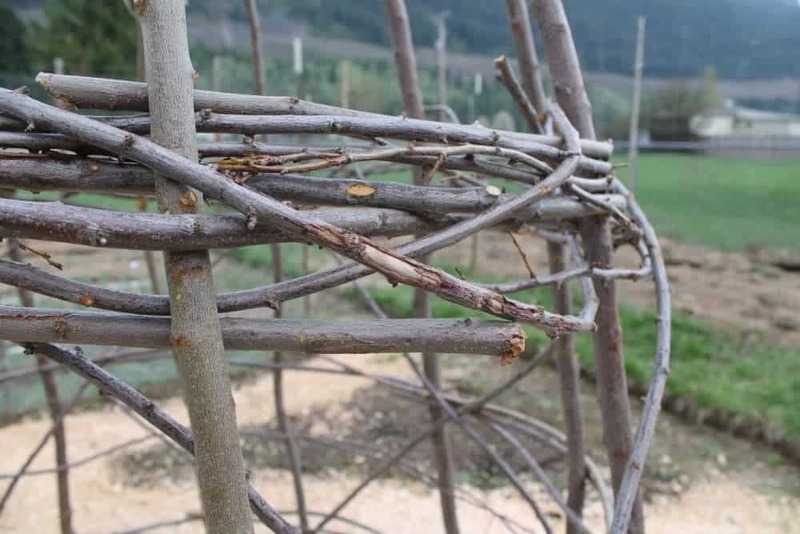 Strong wooden branches were used to build this trellis. 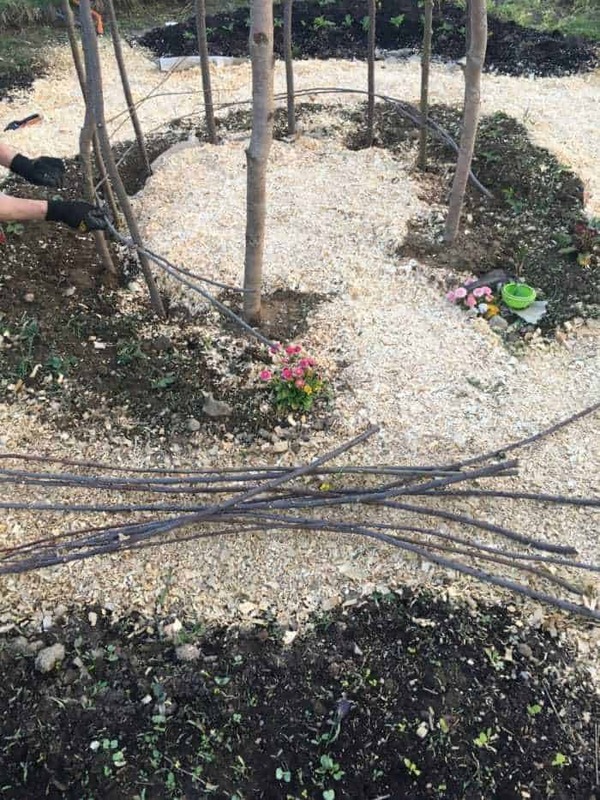 You need the wider branches as supporting beams, and smaller branches to weave through the larger ones. We got these branches for free because we pruned our plum tree. 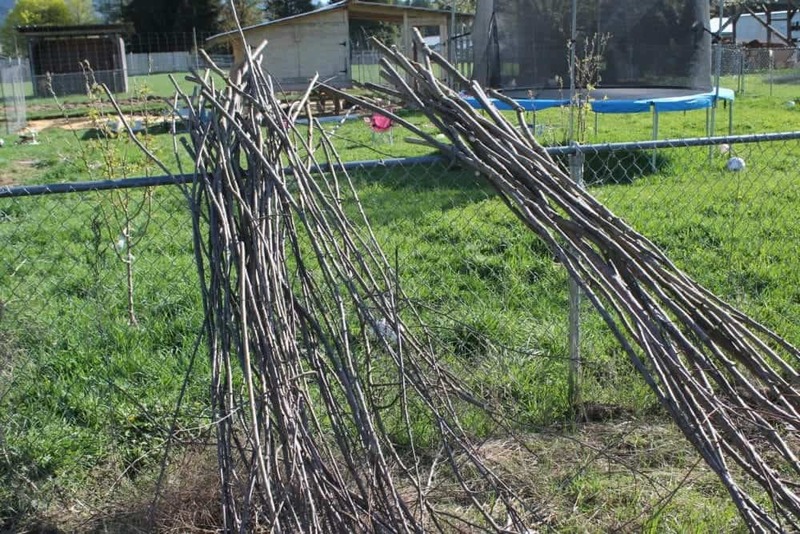 Depending on your homestead, home or neighborhood, you can find free or cheap branches. How can you tell? If you can easily break or snap wood in half then it’s dead wood which shouldn’t be used. If the wood is bendable and sturdy and you can’t break it that’s a good sign you can use it. 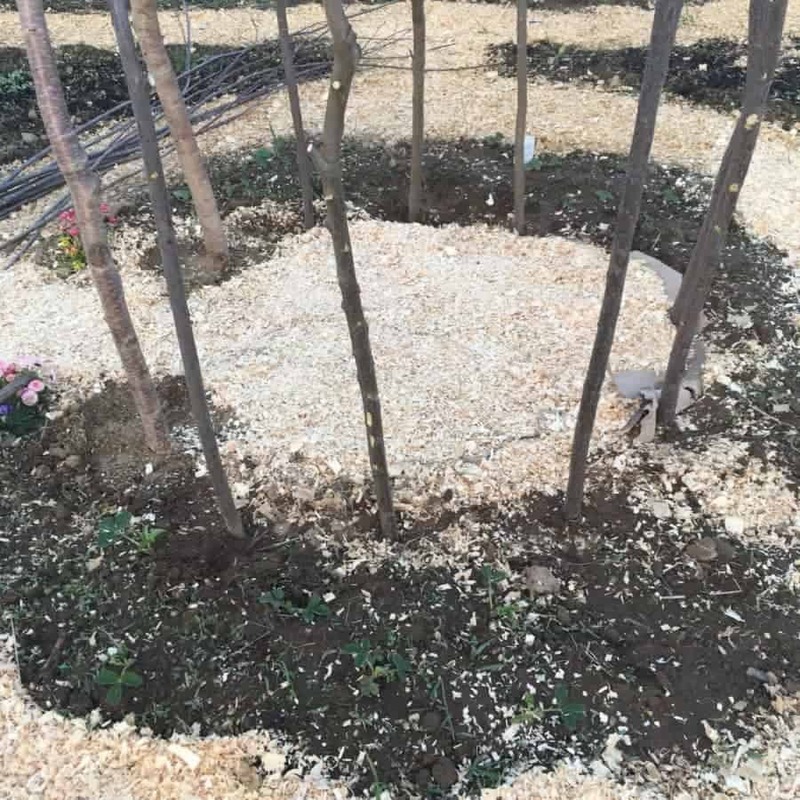 Many trees will have some dead wood and newer stronger wooden branches on them. 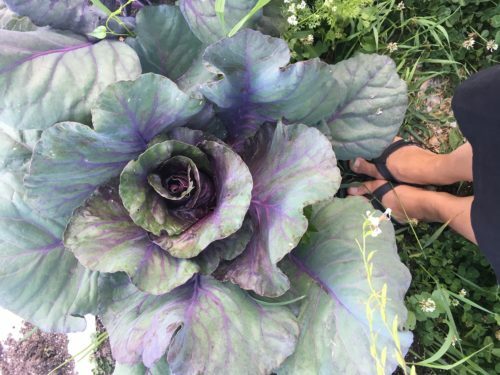 Give them a wiggle too and compact the soil down further. 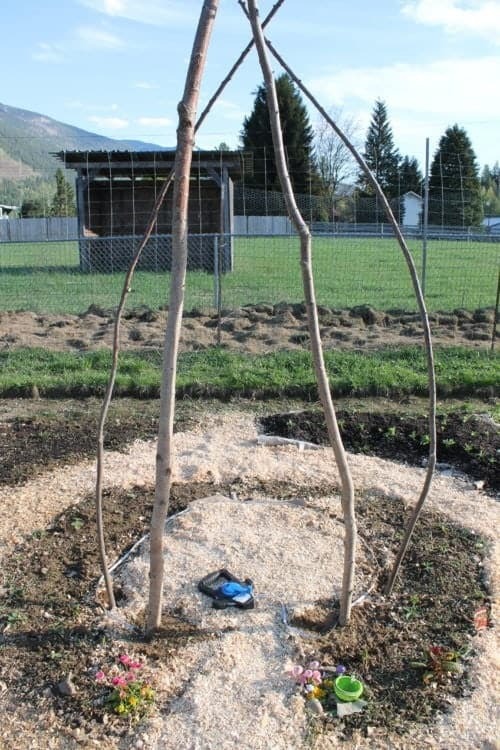 You want nice stable and strong support beams for your trellis. 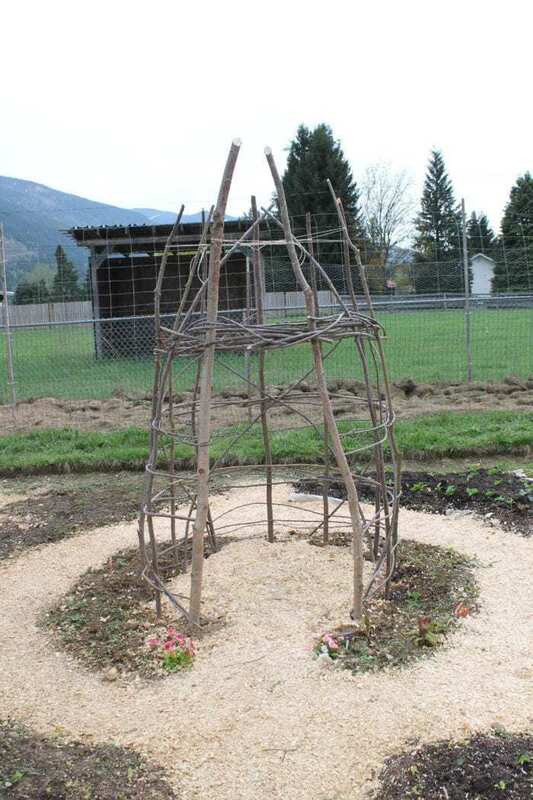 The kids LOVE this fun garden trellis wooden playhouse! 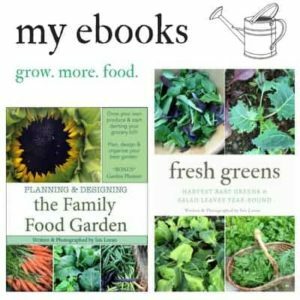 I can’t wait to share with you what it looks like with plants growing up! 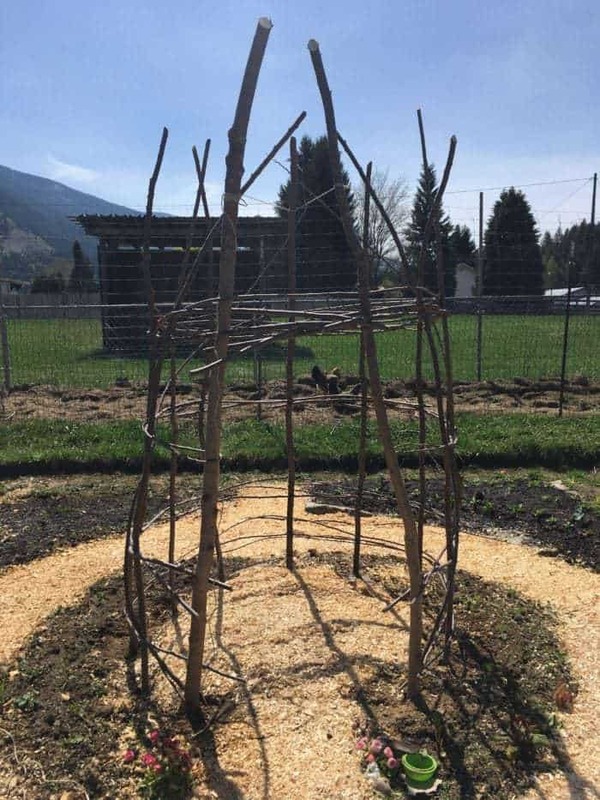 See this project later in the summer as a bean house!